Blossom Station – Child Care Center Inc.
Blossom Station Child Care Center is a full service early childhood program. Our intention is to provide flexibility and dependability, as well as developmental stimulation in a warm, nurturing, and safe environment. Our staff are trained professionals in early childhood education and strive daily to meet your child’s individual needs. We look forward to working together with each family so that we may help every child reach his or her potential. To provide a nurturing environment that encourages personal growth, independence, and a positive self-image. To help a child develop respect for the ideas and feelings of others, tolerate differences, and understand the world around them. To provide a variety of materials and activities that will help the development of fine and gross motor skills. To provide an environment in which children can explore every day phenomena in many first hand sensory ways to increase conceptual understanding. To provide various means of communication and expression through the use of language arts and creative arts. To provide children with an opportunity to enjoy childhood and to make play an important part of every day. We believe that children are individuals with unique learning styles. Children learn through their play, and we try to provide a stimulating environment in which they can satisfy their natural curiosity. Blossom Station has developed a curriculum which challenges every child, and enhances their growth academically, socially, emotionally, and physically. Our curriculum is further enhanced with a comprehensive enrichment program. We strive daily to promote the development of a positive self-image in every child. Our infant program allows an easy transition from home to school while maintaining individual schedules. We provide a stimulating and nurturing environment and communicate with parents on a regular basis through written daily reports. We will provide opportunities for your infant to explore every day phenomena in many first-hand sensory ways to increase conceptual understanding. Our toddler program offers a safe environment that’s perfect for active toddlers to explore. Your toddler is entering an exciting time of growth and discovery. Our toddler teachers create a classroom with many different areas where your child is encouraged to explore and learn. We maintain a daily routine to provide the structure toddlers crave and we offer the excitement of daily discoveries. Blossom Station Child Care Center continues the process of your child’s socialization, communication and independent self-help skills that are vital to the development of the whole child. Here children are exposed to the world around them through nature, music, gym, literacy, dramatic play, blocks, arts & crafts, and field trips. Literacy is achieved with story-telling and exposure to the written word, using a variety of media and communication with their teachers and peers. Creativity is encouraged through role playing with a variety of themes developed in the dramatic play area. Our private, full day, year round kindergarten program was created for children who are resourceful, individualistic, curious, competent and imaginative. Our classroom provides the right blend of child initiated learning and teacher guided curriculum. Our creative developmental curriculum, based upon the Reggio Emilia approach, is comprised of creative art projects, scientific explorations, journal writing and reading skills all of which conform to public school guidelines. The children in the program adhere to the guidelines set forth by the public school system. The small class size is challenging, stimulating, enriching, friendly and enjoyable. Our goal is to send your child to the first grade and beyond with the social, emotional and learning competencies they need to succeed in life. Our Before and After school program supports the public school student. They are able to play with their peers, participate in our monthly science, cooking and music enrichment programs and receive assistance with their homework. Computers are available for each student’s academic support, personal enrichment and recreation. 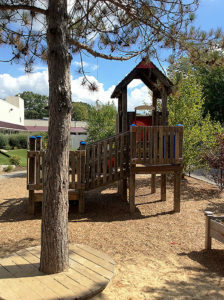 On appropriate weather days the students are able to explore our spacious outdoor recreational area which contains state-of-the art safe climbing structures. Our open door policy encourages visits and inquires from parents. We encourage you to call your child’s teacher, drop by for lunch, and fully participate in your child’s growth process. © 2019 Blossom Station Child Care Center Inc.